Yesterday I gave a brief presentation at a Town Centre Opportunities event in London; the theme of the conference was on revitalising urban space and keeping ‘The High Street’ thriving. I was invited to talk in a supposedly provocative capacity, forming part of a panel debate (along with John Dales, and others) designed to stimulate discussion about alternatives. Pleasingly, however, it seemed that what I had to say (namely, we need to focus much less on the car and car parking when we think about reinvigorating towns, and focus more on enabling different modes of urban transport, and the bicycle in particular) was actually part of something approaching a consensus. This might have had something to do with the fact that representatives of motoring organisations, for instance the AA and the RAC, were not in attendance, despite having been invited. (Nor was Mary Portas). But it was encouraging nonetheless. 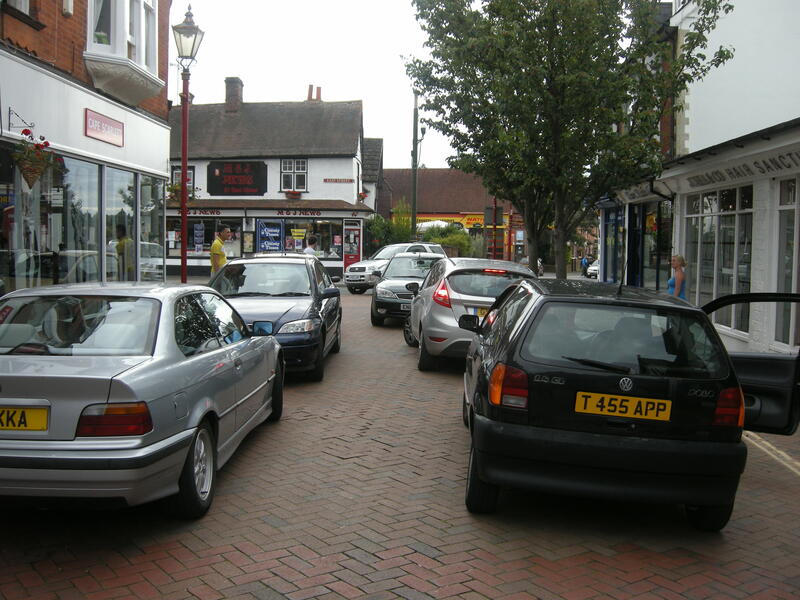 I started by talking about the difficulty town centres currently have in attempting to compete with out of town shopping centres, which are usually easy to access by car, and almost always free to park at. Indeed, one of the speakers before me mentioned how in the mid-1990s, the great majority of new urban development in Britain was out of town – she referred to this period as the beginning of the ‘great death’ of town centres. Out of town land is cheap, and consequently it is relatively easy to accommodate huge areas of parking at low cost. It’s also relatively easy to build big access roads to these shopping centres, so you can funnel huge numbers of motor cars into them. 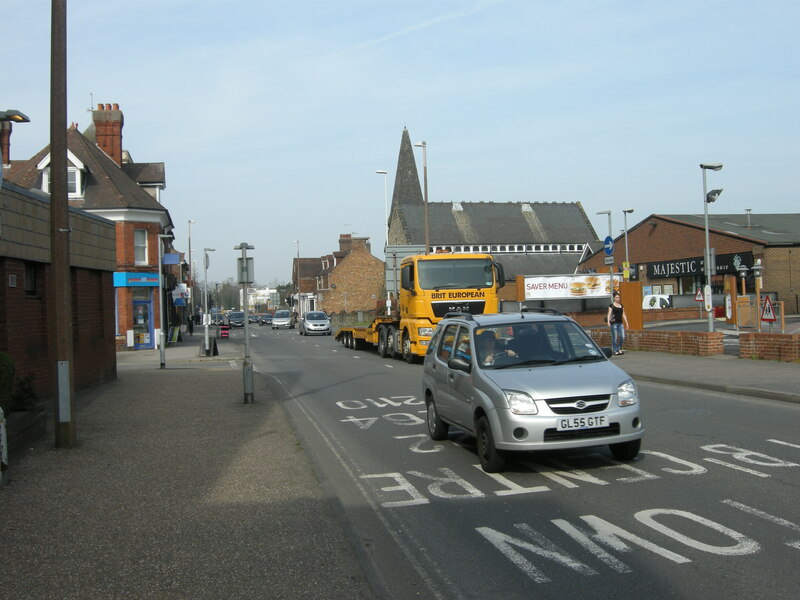 Conversely, it’s much more difficult to push motor vehicles around in towns and cities – although unfortunately that still doesn’t stop us trying to do so. In addition, land is much more expensive in towns and cities, so inevitably storing cars becomes more expensive. 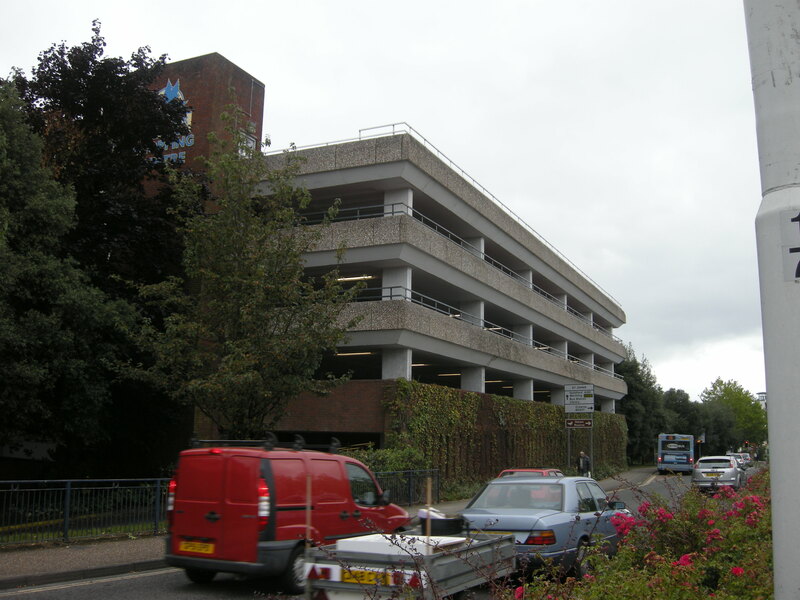 Monstrous multi-storey car parks are required. Cars can also be stored on the street, but this isn’t cheap either – there is a finite supply, and so it has to be charged for. So, out of town centres are usually very easy to get to by car (without the congestion and stress involved in navigating town centres), and are free to visit. Town centres are at a competitive disadvantage. The Portas Review [pdf] recommends a number of measures to redress the balance, including a presumption in favour of town centre, rather than out of town, development. But on the subject of access to towns, the Portas strategy is rather unimaginative – namely, to attempt to make high streets as cheap and easy to access by car as out of town centres. and a parking ‘league table’, showing which authorities are charging the most (doubtless in an attempt to encourage them to charge less). There’s even an attractive illustration of someone happily shopping, thanks to free parking. And, of course, more car parking in towns means more driving, which means streets are noisier, less pleasant, and less safe. But making it cheaper and easier to park in town centres will inevitably result in the opposite – busier roads, less pleasant streets, and less safety. A worse environment for the people you actually want to visit towns, and to stick around in them. Places that you don’t want to be in. 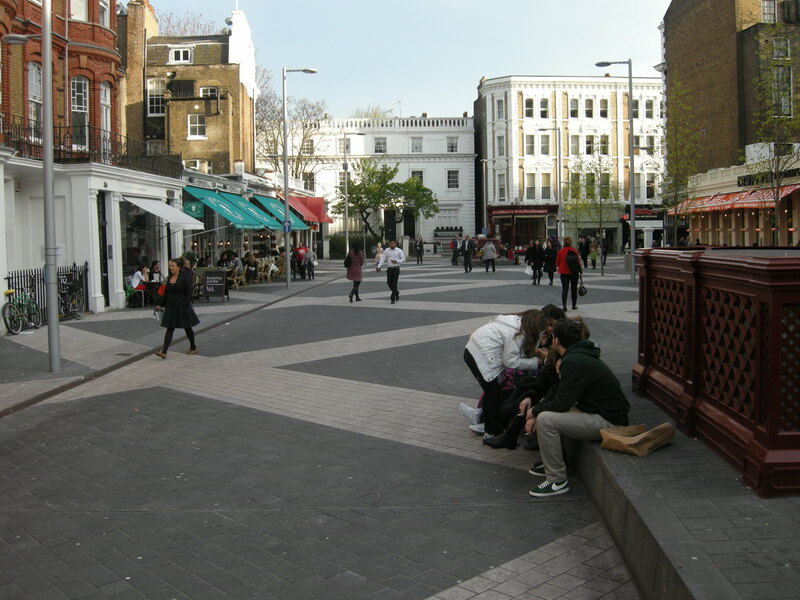 We already know that attractive, convivial streets are usually low traffic environments, often without car parking. (This is the southern section of Exhibition Road – only a matter of yards from the street in the previous photograph). So – we know that town centre streets need cheap and easy access if they are to successfully compete with out of town shopping. But unfortunately too much cheap and easy access by car can ruin these places as destinations. 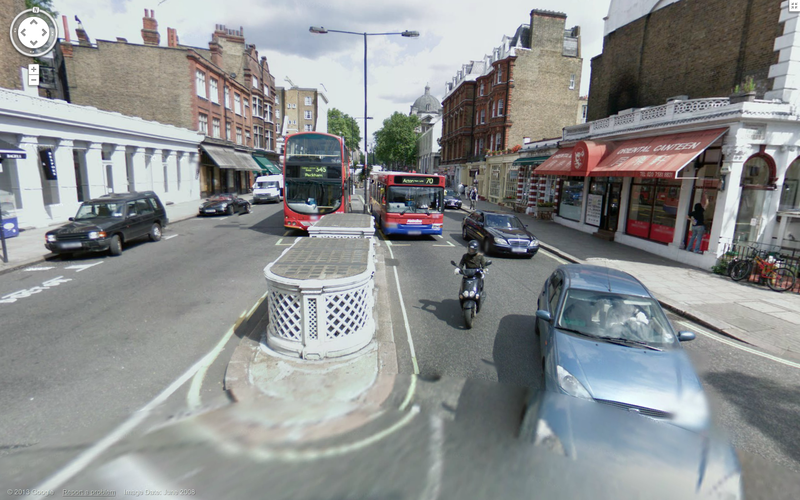 For example, nobody wanted to hang around on the southern section of Exhibition Road when it looked like this. So what’s the solution to this conflict between accessibility and amenity? The answer is, of course, the bicycle. At least 50 bicycles parked in front of a Dutch supermarket. Right in front of it. But no congestion, no difficulty in finding a spot to park, no noise, and very little danger. The street remains a pleasant place. 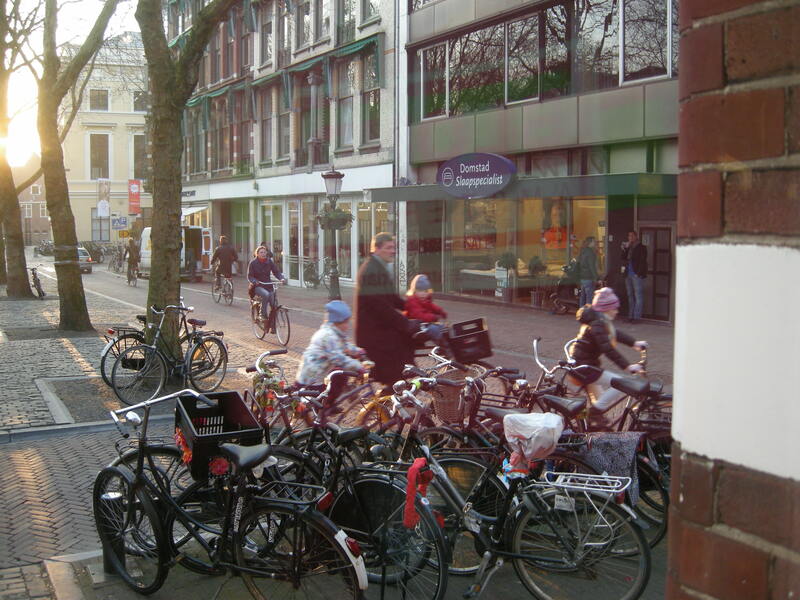 70% of Dutch supermarket shopping is carried out on foot, or by bike, and for very good reason – because the Dutch want things this way. Walking and cycling have been made the obvious way to get about for short urban trips. 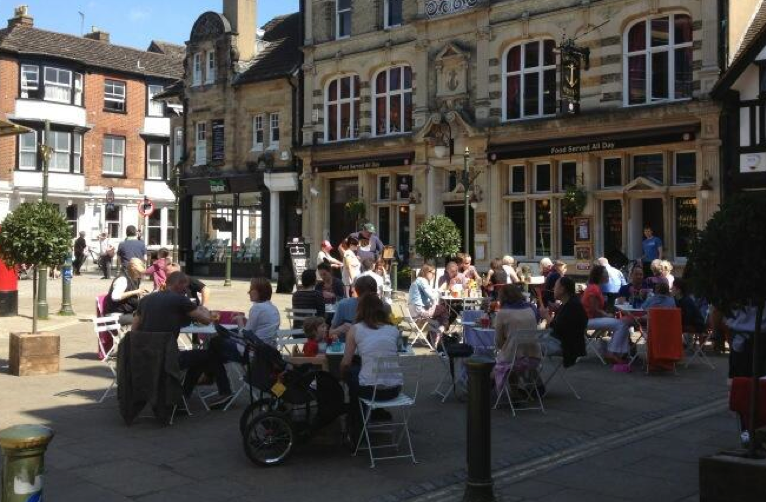 And as a consequence their town and city centres are calm, beautiful and attractive places. This hasn’t happened by accident; making the bicycle easy to use has been designed into the streetscape. In Britain, by contrast, using a bicycle to get about town is probably the very last mode of transport most people would contemplate using. Conditions for cycling are intimidating and hostile. But, as I said during my presentation, there is no reason why we cannot change. 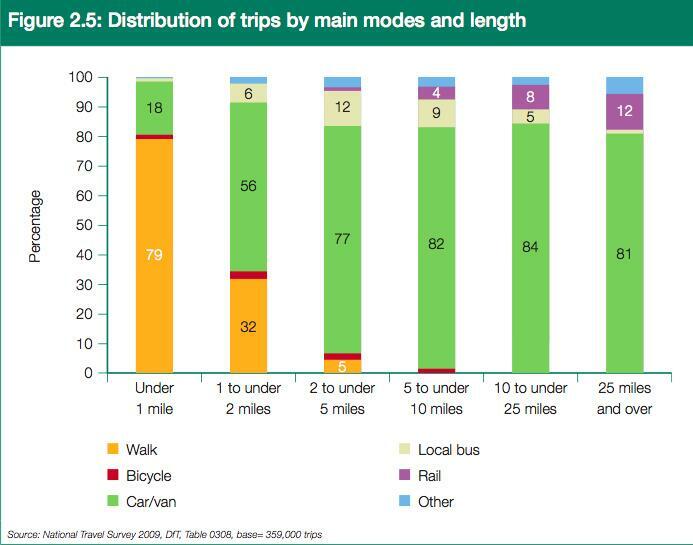 66% of all British trips are less than 5 miles; 38% are less than 2 miles. A considerable proportion of these trips could easily be cycled by most people if the conditions were right. Of course the Netherlands is flatter than the UK, but most short trips in British towns and cities are, to all intents and purposes, pretty flat. Topography is no excuse for our dismal failure to realise a sane urban transport policy. 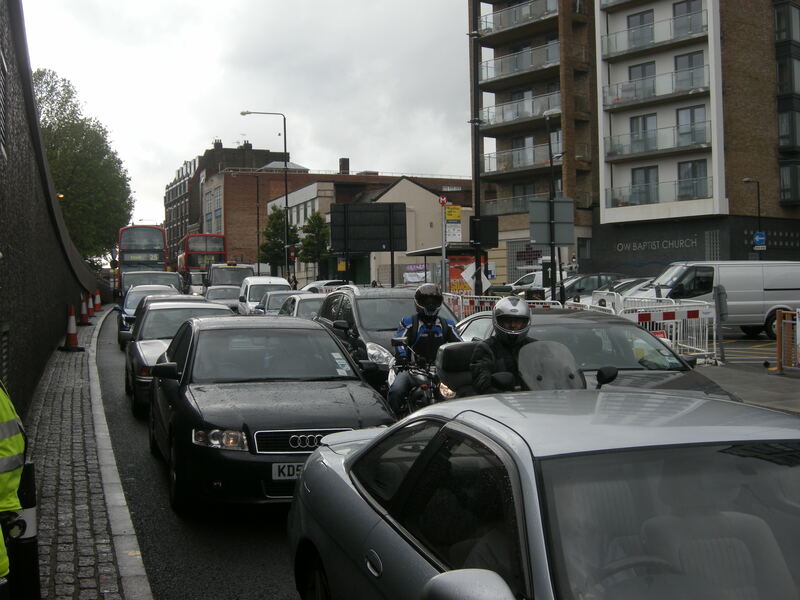 56% – that’s over half – of all trips between 1-2 miles long in Britain are driven, which is both a consequence and an explanation of why our towns and cities are so often unpleasant, traffic-dominated places. 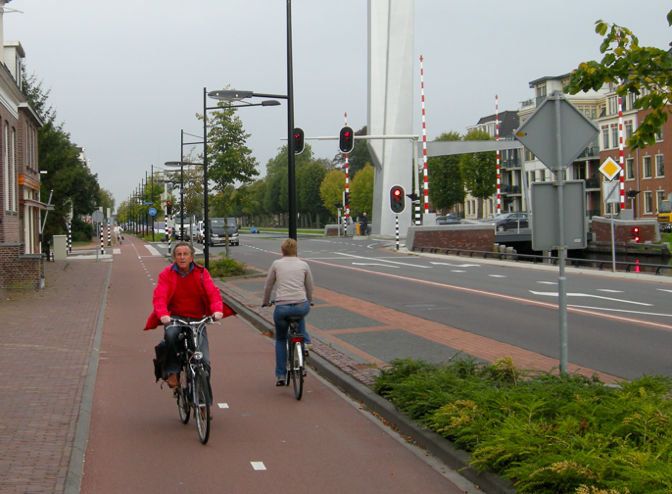 Just 2% of British trips under 3 miles are cycled; the equivalent figure for the Netherlands is 39%. That doesn’t mean that the Dutch have simply abandoned cars; they own more of them per capita than the UK. It just means that Dutch urban areas are designed in such a way that the bicycle – a brilliant mode of transport in its own right – naturally comes to the fore. My final point in the presentation was that reducing car use in urban areas does not mean reducing trade. Not only are Dutch towns thriving, bustling places (at least, the ones I have visited), we already know that the amount of spending in towns corresponds poorly to motor vehicle use. Even under current British conditions – with walking and cycling relatively unattractive, compared to driving – research consistently shows that people arriving on foot, by bike, or by public transport spend more over the long term than those arriving by car. They may not be filling up their large boot with goods (unfortunately, so easy to visualise), but they will be making more visits, and spending more overall. People arriving in a town centre on foot or by bike are more likely to stop spontaneously. They are not committed to finding a parking space; if they see something (or someone) interesting, they can stop where they like. They can also stay around as long as they want, with no concerns about retrieving their vehicle. It’s also easier (and cheaper) for them to come and go more frequently – anecdotally, I am much more inclined to pop into town for a trivial purpose if it’s by bike, than by car, simply because it’s much less hassle. And finally – and probably most importantly – if most trips into a town are by bike, or by foot, the town itself becomes an attractive place where people will want to be. It’s a great pity that the Portas Review had nothing at all to say about how we get into our towns beyond the use of the car, and equally that it did not seem to appreciate how making it easier to drive into and park in them can destroy the very attractiveness that the Review itself recognises as important. Thankfully, going by the discussion yesterday, I’m not the only one who was disappointed with the Review, and who appreciates that there is more to urban transport than the motor car. 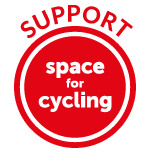 This entry was posted in Car dependence, Cycling Embassy Of Great Britain, Department for Transport, Infrastructure, Parking, Pedestrianisation, Subjective safety, Sustrans, The Netherlands, Town planning, Transport policy. Bookmark the permalink. Did you make any reference in your presentation about those who are less mobile – the old, very young and disabled – and how they access car-free centres? I’m over 60 , I walk with a cane and ride a tricycle. A car free centre is not a problem at all! Being old or disabled doesn’t mean you have to depent so much on a car. If cycling is not possible one could ride a mobility scooter or a motorized wheelchair. In the U.K. people seem to be hold hostage by car centric Taliban. Set yourself free! You might equally ask that question of a BlueWater or Westfields – easy to park but you still have to walk the final stage, and quite probably further than you would have to walk from a car park in small town like Horsham or Guildford – or from the park&ride bus stop. There seems to be an assumption that people are attracted to out-of-town malls by their abundant free parking. There was even a reference to such in one of Mark’s earlier posts, quoting I think a letter in the local paper about someone who would prefer to drive to Bluewater (>100 mile round trip, say 10 litres of petrol) rather than pay £2 to park in Horsham. Bullsh*t – you don’t drive 100 miles for the parking, you drive 100 miles because when you have parked, you find a safe, protected, traffic-free space full of the shops you want to visit. If your town centre was safe, protected, traffic free, the shops you want to visit would soon be looking for vacant units there, eg M&S foods looking for premises in Godalming High Street. Paul and Inge: I’m with you! I was just wondering if, in the original presentation, whether non-cyclist/disabled access was mentioned. It’s a common canard used by many against car-free centres, as you probably know. I’m not sure if Nigel is saying that less mobile groups must have car access to town centres but more just asking how it’s done. In Cambridge there is a group doing just this. And in recent “fun rides” the young enthusiastic riders do actually go quite a long distance. And in Cambridge, we have a growing plethora of child cycle carriers of all styles. The best I saw had 3 kids in a big front box, all facing each other and playing together in the middle. @radwagon1: I was asking what arrangements might be proposed to alleviate concerns by not only less mobile people, but those who have no wish to use a bike or walk – free choice and all that. It’s another common canard thrown us that somehow we are proposing “forcing” people to change modes rather than “enabling” and removing barriers – real or imagined – to non-car use. In the town where I live, there are several good bus services with many stops , making the shopping centres very well accessible for people who don’t want to cycle or walk to far. There is also the option to Park and Ride. For a small fee customers can park their car and access free public transport (for up to 5 people). 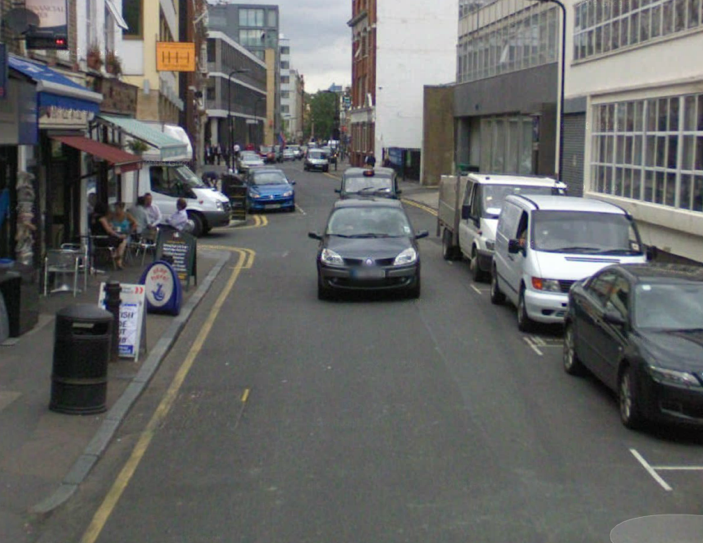 I also think it’s worth saying again that at any given time, only a small minority of shoppers or diners can benefit from parking places immediately outside (or near to) the shop/restaurant in question. But having the roads clogged with cars – parked, or trying to park, or just passing through – makes the area less pleasant for everyone. 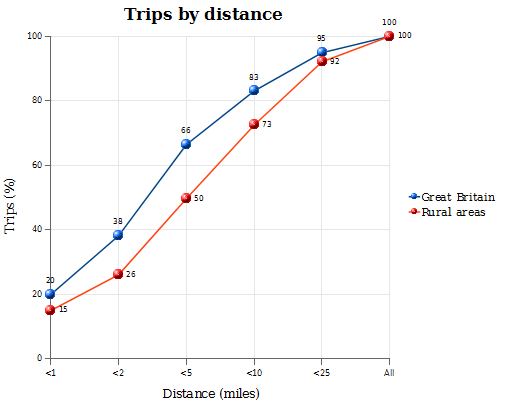 That DfT distance vs mode chart is interesting (and a little depressing). Who are all these people driving less than a mile? Here is an example of one of the “Portas” towns who have “identified that cycling should be at the core of its strategy”. Sadly it would seem that many local traders still believe the myth being peddled by the national media. Great article, really thought provoking. There’s one omission and that is the ‘bus’ or for many towns and cities the Park & Ride. Cambridge has invested heavily in P&R and has 5 sites, approximately 3 miles from the city centre aimed at workers and shoppers. For shopping, all my anecdotal observation shows that P&R is popular for long-stay shopping trips – it’s an investment in time people are prepared to make given their length of stay – and this is similar to people burning time driving to major shopping centres in or out of town. Buses do cut congestion leaving a more car free city but need to be designed in with care. The roads and drop off points for buses in Cambridge City are unpleasant places to stay too. 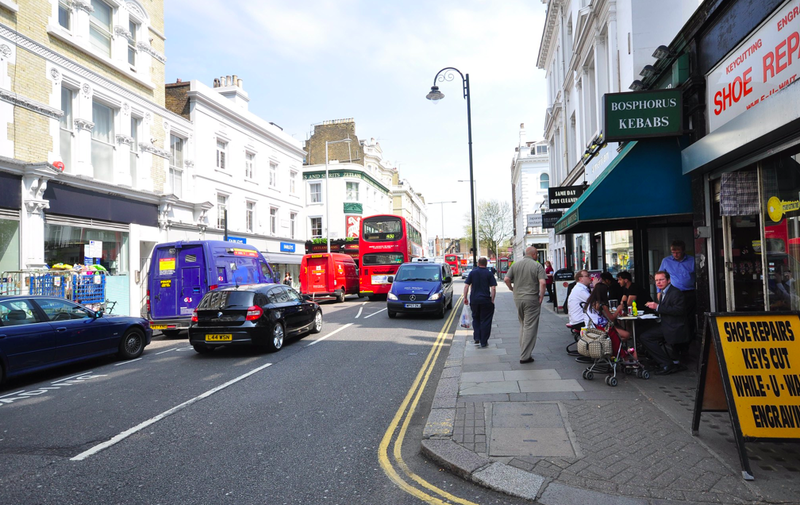 As you show, walkers and cyclists extend the pleasant shopping areas outside of segregated shopping-centres to retailers on any (quiet) street – most likely the smaller independent local businesses who stop our cities being clones of each other. I agree with the article in general. Cars are just not a viable means for the majority to get access densely-built-up areas. Mary Portas’s fixation on ‘free parking’ exasperates me, the last thing town centres need is still more acres of space clogged up with parked cars. But the comment “They are not committed to finding a parking space” does remind me of one reason why I sometimes walk in preference to cycling, even for journeys of a few miles – sometimes you know you are going to struggle to find anywhere to lock up the bike! E.g. pub with 40 car parking places but not a single secure place to lock a bike. 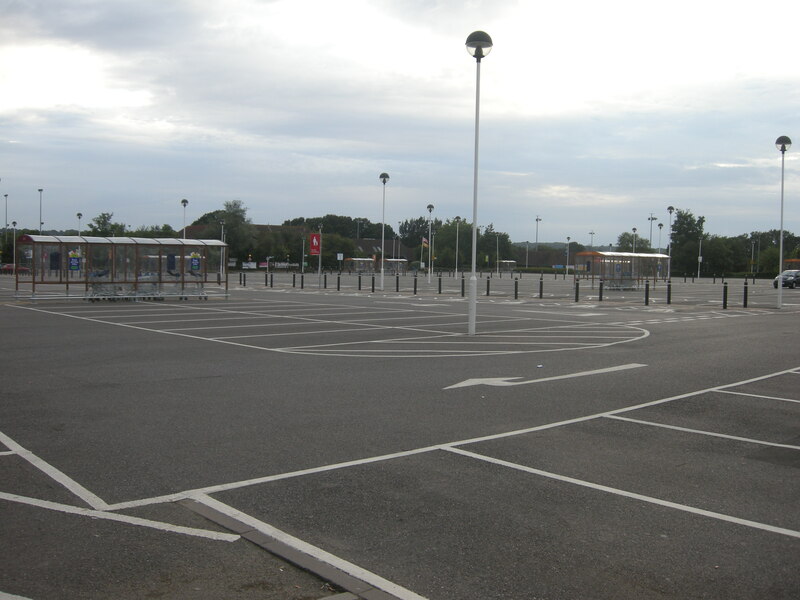 Ely (Cambridgeshire) has just ‘won’ the battle to keep it’s 2 hour free parking after the District Council lost paid parking by the end of the consultation. It’s been hailed as fantastic news and according to most of the City Council (me and a couple of others being the exception) that we should be shouting it from the top of the Cathedral. Never mind that the tourists and visitors can’t find any parking because all the locals have taken it. Mary Portas mentioned Ely and that we would loose our town centre to out of town developments if we didn’t watch out. We’ve lost our town centre to as high as Cambridge business rates first and Ely is currently a top rate destination for charity shops. I attended the Major Making tonight in Ely and got talking to the ex Mayor’s wife who hates cyclists and told me that she got hit by one in Amsterdam because she backed off the pavement into the cycle lane without looking and he didn’t stop and apologise to her. I did ask her if she’d been injured and said she wasn’t. I then went on to say I got hit by a car turning right and left for dead with concussion, a broken collar bone and broken ribs. This pretty much ended the conversation before I was able to ask if she would walk out on to Ely highstreet backwards without looking. There are alot of short sighted people out there who can’t see that our town centres need free easy parking like they need holes in their heads, especially Ely. On another note, it was nice to see my old local supermarket in Utrecht in your pictures. Happy memories. 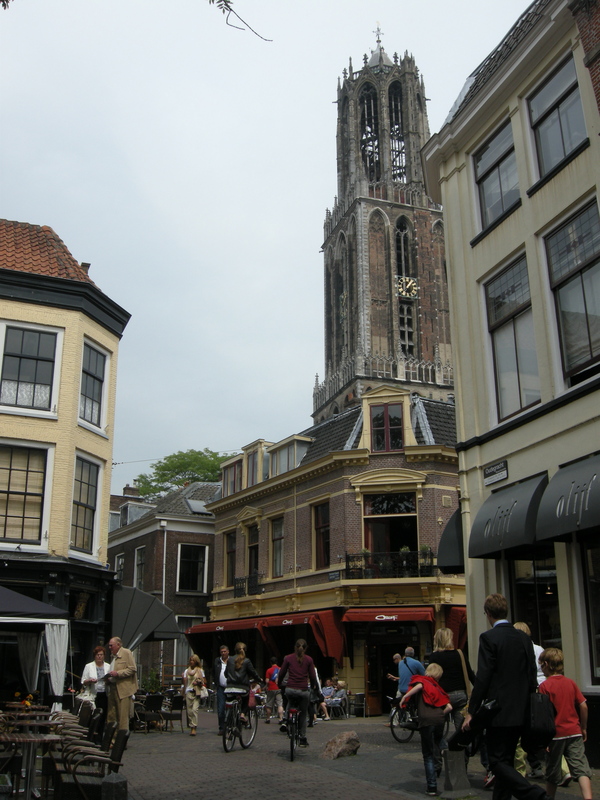 Utrecht is a fantastic place to shop!